In today’s NFL, the rookie curve of old has seemingly lost some of it’s allure. It’s vigor. Nowadays, rookies come in and impact the game from Day 1. First-year players dominate week in and week out across the NFL landscape. See Kareem Hunt, Marshon Lattimore, Tre’Davious White, etc. etc. The list goes on but what about those who actually sustain their play and reach the ultimate goal of elite status within the NFL brotherhood? That list contains far fewer than the list of breakout rookie stars or second-year standouts. A name on this list is harder to come by. With that in mind, here are several young up-and-comers in the NFL who are on the cusp of elite status as we enter 2018. A list in which we won’t be surprised if they’re topping the charts in one way or the other at the end of the season. Concerns surrounding his play strength, long speed and positional versatility fed into former Maryland standout Stefon Diggs’ free fall in the 2015 NFL Draft, as he dropped down to the Minnesota Vikings’ lap at pick No. 146 in the fifth round. All 32 NFL teams passed on Diggs at least once, and now, all but one of the 32 wished they hadn’t. The 6-foot, 195-pound Diggs was thought to have no chance along the boundary at the next level, but he’s since proved any doubters wrong. In Diggs’ three years in the NFL, he has run 64.7 percent of his 1,317 career routes away from the slot, and on said routes, he has averaged 1.94 yards per route run (YPRR) to rank 25th among wide receivers with at least 700 routes run over the past three seasons. He also ranks 25th in three-year slot YPRR (1.76) and 20th in total YPPR from all alignments (1.88), proving his worth inside and out. 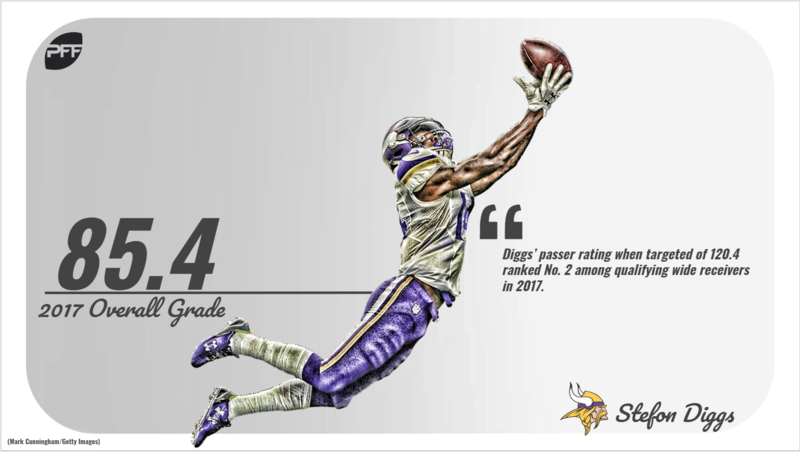 In addition to his three years of consistent, high-end production, Diggs put together a career year in 2017, ranking eighth among qualifying wide receivers in overall grade at 85.4. He ranked second in passer rating when targeted (120.4) and 19th in drop rate (5.88) among wide receivers with at least 82 catchable targets. Earning 82.6-plus overall grades in every year of his career and still trending up as of late, Diggs is making a case for a seat among the league’s best at the wide receiver position heading into Year 4 of his NFL journey. Like Diggs, Yannick Ngakoue is a Maryland product that fell further in the draft than any NFL team would let happen again if given a second chance at the 2016 NFL Draft. The Jacksonville Jaguars, of course, are the lone franchise happy with the result. Ngakoue earned a career-high 83.6 overall grade in addition to the 15th-ranked pass-rush grade (86.2) among qualifying edge defenders in his sophomore campaign. The 6-foot-2, 246-pounder put an end to any doubts surrounding his small stature as he recorded 70 total pressures (43 hurries, 14 hits, 13 sacks) across his 437 pass-rushing snaps in 2017, ranking tied for seventh in pass-rush productivity (12.8). Having earned a 43.0 overall grade in 2016, Ngakoue is just one year removed from an underwhelming rookie campaign, and he’s still yet to prove reliable as a run defender in either of his two years in the NFL. However, his 2017 production appears sustainable enough for him to carve out a role as an elite pass-rusher in this league. Former LSU standout Deion Jones has become one of the NFL’s best off-ball linebackers in just two years with the Atlanta Falcons, as he’s proven to fit the mold of the much-needed coverage linebacker in today’s pass-happy league. In 2017, Jones allowed just 5.44 yards per target and 0.74 yards per snap in coverage, ranking fourth and seventh among off-ball linebackers with at least 200 coverage snaps, respectively. He also earned a 94.8 coverage grade for his efforts last season, which led all qualifying linebackers. Jones’ ability to impact the passing game from the linebacker position is unparalleled, and now having earned 81.3-plus overall grades in each of the past two seasons, his place among the NFL’s elite off-ball linebackers can be cemented with another outstanding performance in 2018. Dating back to the 2006 season, 492 running backs have totaled at least 150 touches in a single season, and of the 492, only one has recorded a single-season elusive rating above 96.3 – his name is Alvin Kamara. The New Orleans Saints’ rookie sensation averaged 3.83 yards after contact per attempt and forced 57 missed tackles across his 201 touches a year ago, leading to a record-breaking 108.5 elusive rating in 2017. Kamara’s forced missed tackle rate (0.28) this past season also stood out in the record books, as it ranks second among the aforementioned set of ball carriers only to Marshawn Lynch’s 0.32 mark with the Seattle Seahawks in 2014. Adding to his resume, Kamara’s elite production on the ground is matched if not exceeded when catching the ball out of the backfield, as he led all running backs with at least five targets in yards per route run (2.84) a year ago. He caught 81-of-96 targets for 826 yards – 703 of which came after the catch – and five touchdowns. 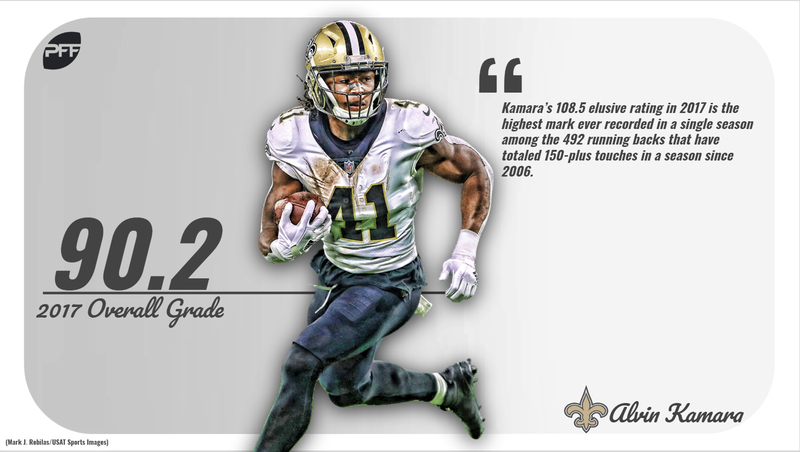 Similar to Jones, Kamara represents the next generation of his position, as he embodies the dual-threat running back all offenses need to excel both running and passing the football. Tennessee Titans second-year safety Kevin Byard grew in notoriety this past season largely because of his interception total (eight), and unlike other instances of fame driven by box-score production, his praise was much deserved. The former Middle Tennessee product has improved his play steadily since Week 6 of his rookie campaign, paving the way for a stellar sophomore season. Byard earned a career-high 89.0 overall grade in 2017, which was good for fourth among qualifying safeties. He also ranked 20th in passer rating when targeted (88.3) and 12th in yards allowed per reception among safeties with at least 25 targets in 2017. Byard’s game is far from perfect this early in his career, but his early returns are promising given his limited experience. If he can continue to attack his development and round out his coverage skills, he can be one of the best free safeties in the NFL. 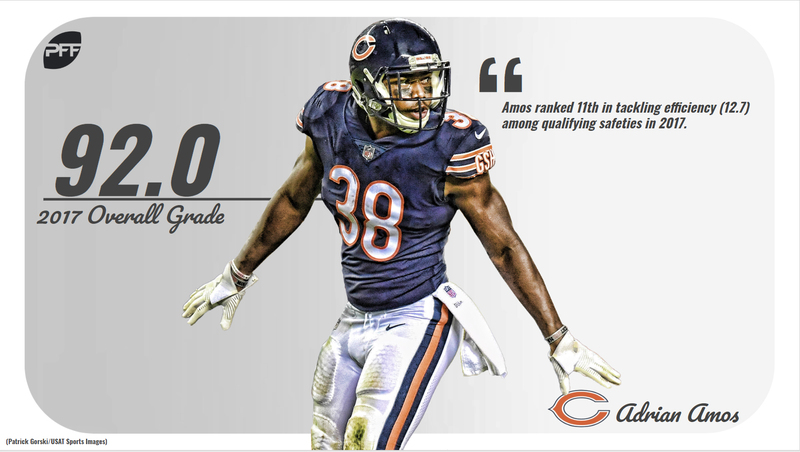 The Chicago Bears took a trial-by-fire approach with fifth-round safety Adrian Amos early in his career, as the former Penn State product played north of 930 defensive snaps in each of his first two seasons in the NFL. The Bears’ early investment in Amos has seemingly paid off. Cast into a starting role when veteran safety Quentin Demps broke his arm in Week 3, Amos earned a career-high 92.0 overall grade in 2017, ranking No. 1 among the league’s qualifying safeties. He ranked second in yards allowed per reception (7.1) and 15th in passer rating when targeted (81.8). He also flashed strong tackling ability on receptions, as he allowed just 3.50 yards after the catch per reception allowed, ranking fifth among safeties with at least 25 targets this past season. Amos’ 2017 production should keep him from relying on injury to start in Chicago and as long as he can pick up where he left off ago, he’ll solidify his elite status. Slotted as the No. 2 overall player in our final big board prior to the 2016 NFL Draft, San Francisco 49ers interior defender DeForest Buckner met high expectations in Year 2 of his career, earning an elite 90.4 overall grade to tie for sixth-best at his position in 2017. The 24-year-old Oregon product was at his best attacking the quarterback, as evidenced by his third-ranked pass-rush grade (89.6) in 2017. He also ranked 12th among interior defenders in pass-rush productivity (8.4), recording 52 total pressures across his 475 pass-rushing snaps. Buckner wasn’t without flaw in 2017, but when firing on all cylinders, his play was elite. Improving his game-to-game consistency will play a key role in his pursuit of greatness in the trenches. A phrase no more prevalent than in Tyreek Hill’s case, speed kills. The NFL’s self-proclaimed cheetah has been quick to outplay his fifth-round draft status in his two-year tenure with the Kansas City Chiefs, totaling 2,822 yards and 19 touchdowns from scrimmage in said span. 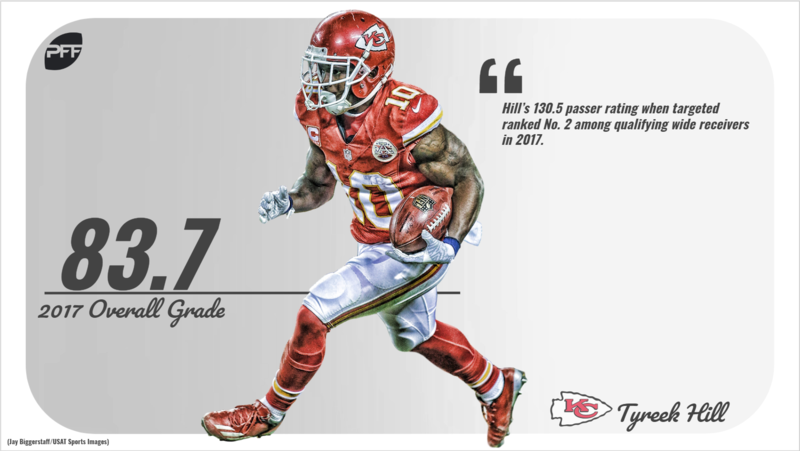 Most recently, Hill put together a career year as the Chiefs’ go-to guy, as he ranked second in passer rating when targeted (130.5) and sixth in yards per route run among wideouts with at least 42 total targets in 2017. He also earned a career-high 83.7 overall grade for his efforts. Hill’s great long speed is most notable on deep passes, as he led all wide receivers in deep (20-plus air yards) receiving yards (626) and ranked second in catch rate on deep passes (54.2) in 2017. Specifically looking at ‘go’ routes, Hill caught 11-of-22 targets for 562 yards and five touchdowns for a passer rating of 122.9 – a whole 56.5 points above the league average. Hill’s limited route tree and high drop rate are reasons for concern, but his speed and short-area quickness make up for what he lacks in other areas. Fortunately for Kansas City, he is showing no signs of slowing down. Another young buck bound for big things in Kansas City, former Mississippi State interior defender Chris Jones undeservedly fell to the Chiefs at pick No. 37 in the 2016 NFL Draft. He’s now proving why he should have gone much higher. After earning a respectable 84.4 overall grade across 612 defensive snaps as a rookie, Jones improved his overall grade by 3.4 points to rank 12th among qualifying interior defenders at 88.2 in 2017. He also tied for ninth in pass-rush grade (85.2). Attacking the passer, Jones recorded 38 total pressures (27 hurries, five hits, six sacks) across his 398 pass-rushing snaps, giving him the 19th-ranked pass-rush productivity (7.5) among interior defenders with at least 150 pass-rushing snaps in 2017. Jones’ repertoire of pass-rush moves is expansive, as he’s able to win with both power and quickness early and often. Such versatility in his game bodes well for his long-term success at the position. 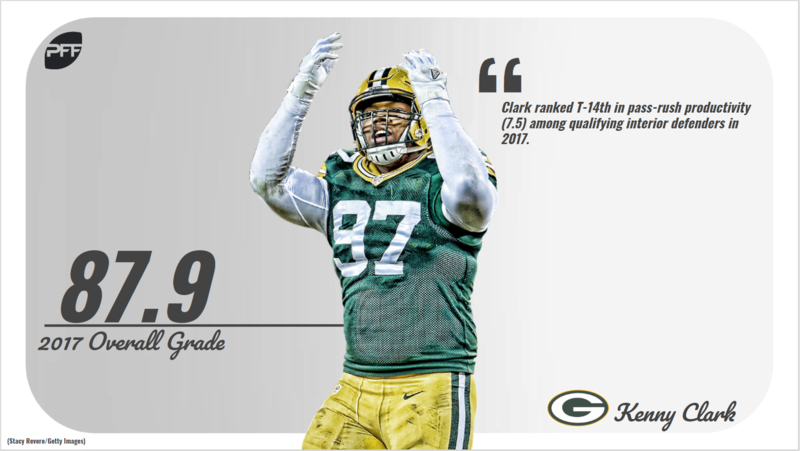 Playing north of 40.0 percent of his defensive snaps either head up or shaded on the center, Green Bay Packers interior defender Kenny Clark is expected to own his opposition against the run and provide upside as an interior pass-rusher. To his credit, he’s done just that. The former UCLA standout and 2016 first-rounder flew under the radar as one of the league’s best nose tackles this past season, as he earned a career-high 87.9 overall grade to rank 13th among qualifying interior defenders. He also ranked 12th in run-stop percentage (9.1) and tied for seventh in pass-rush productivity (7.5) among qualifying defensive tackles. Clark’s ceiling may not mirror that of Los Angeles Rams’ Aaron Donald, but it’s high enough for him to join the elite conversation if he can string together another productive year and continue his reign in 2018.